Cake pops are delicious balls of cake presented on a stick. 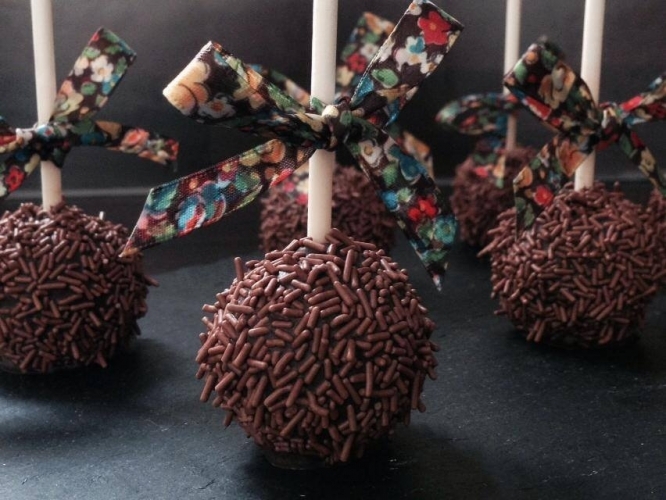 Using the finest ingredients, we make our cake pop mixture from freshly baked cakes which are crumbled and mixed with delicious buttercream, rolled into bite-size balls and inserted with a lollipop stick. 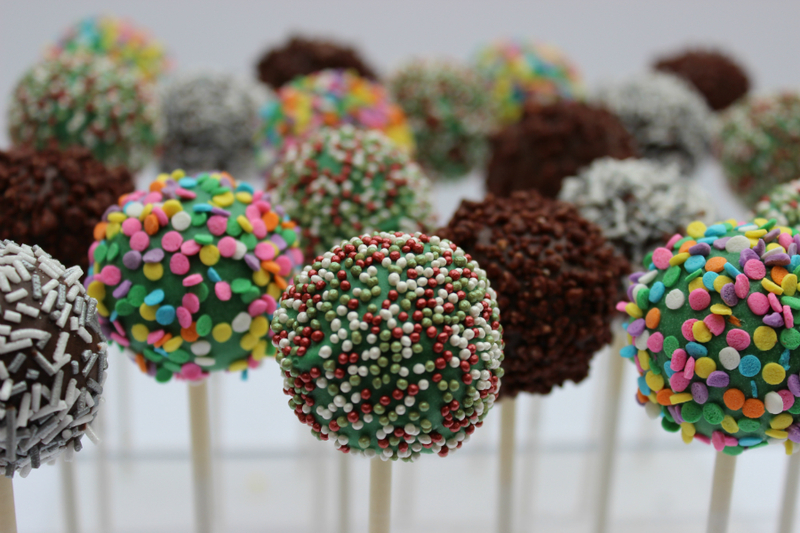 Our cake pops are then finished with a delightful chocolate coating and decorated with sprinkles, drizzles or dusting. 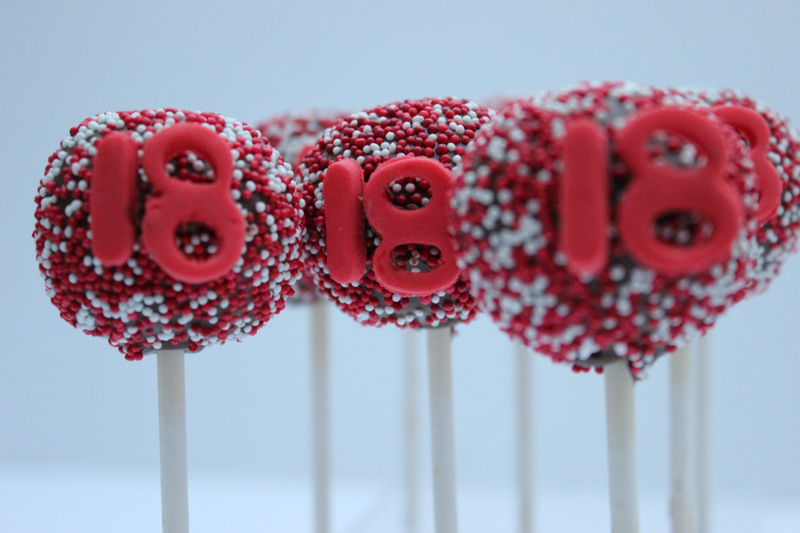 We also make non-bake cookie pops which are made from ground cookies, such as Oreos, which are then mixed with cream cheese and finished with a chocolate coating and decorated. 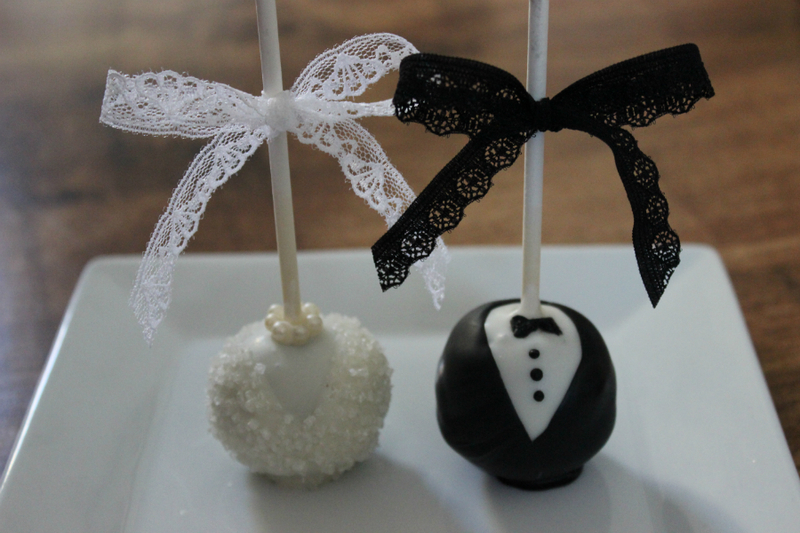 Our cake pops are handmade and can be designed to suit any theme or occasion. From fun, novel princess or pirate pops for children’s parties to elegant ‘his and her’ wedding pops for the most special of special days, cake pops are perfect as sweet treats and party bag fillers, unique gifts, elegant favours or for when you want a special little treat yourself. If you’re ordering cake pops for a special occasion or event, we can create a stunning bespoke display using stands and decorations. Please enquire for more information. Chocolate sponge mixed with chocolate buttercream, dipped in chocolate and finished with various decorations and sprinkles. The chocolate, sprinkles and decorations are available in many colours. Vanilla sponge mixed with vanilla buttercream, dipped in chocolate and finished with various decorations and sprinkles. The chocolate, sprinkles and decorations are available in many colours. Chocolate sponge mixed with chocolate buttercream, dipped in mint chocolate and finished with mint chocolate crisps. No baking involved with these cake pops. Oreo cookies are crumbled and mixed with cream cheese to create a fudgy texture, then dipped in chocolate and finished with various decorations and sprinkles. The chocolate, sprinkles and decorations are available in many colours. Vanilla sponge mixed with strawberry jam, dipped in white chocolate and finished with various decorations and sprinkles. The chocolate, sprinkles and decorations are available in many colours. Lemon cake sponge mixed with lemon buttercream, dipped in chocolate and finished with various decorations and sprinkles. The chocolate, sprinkles and decorations are available in many colours. The chocolate coating, sprinkles and decorations are available in many colours and varieties and can be made to match any theme. The cake pops can be individually wrapped in cellophane wrapping or clear bags, tied with ribbon and personalised messages or gift tags Stand hire and set-up service is available. A deposit is required for stand hire. We are based in Watford, Hertfordshire. All orders can be collected for free. We deliver to most of London and the South East, delivery charges apply, please request a quote.